Sightless Pit is a medium-sized Dwarven ruin in Winterhold that is infested with Falmer. The entrance is located west of Shrine of Azura and marked by a single Falmer tent. It consists of three zones: Sightless Pit, Temple of Xrib, and Abandoned Cave. Unlike most caves, you must drop down into this one, making it impossible to leave the way you came in and forcing you to traverse the entire cave system to return to the surface. There are a lot of vertical elements in this cave system and the creatures are all leveled. Upon dropping into the hole in the ground, you will find yourself at the edge of a large pool of water surrounded by icy walls with a tunnel leading to the north. A search of the deep pool of water reveals nothing of interest. Following the tunnel, it passes a glowing mushroom on the right-hand wall and then turns to the east. A short way further it turns back to the north and opens into a cavern with a small camp consisting of a campfire with three unowned bed rolls around it and three barrels to the west, beside a flat-topped rock with a large coin purse, a pickaxe, a copy of the Pickpocket skill book Aevar Stone-Singer and a sliced goat cheese on top. On one of the barrels is a bottle of alto wine and two bottles of wine. The cavern continues to the north, where a ledge descends around the walls of the cavern. Immediately below the camp on a ledge is a dead bandit pierced by numerous Falmer arrows and an unlocked chest. The path descends to a level below this ledge where another two bandits corpses can be found, presumably they are the ones who set up the camp. There are a few glowing mushrooms found throughout the cave system. The path continues heading west and turns to the south after a short way. Take care along here as there is a pressure plate in the middle of the floor, on a darker patch, where it is harder to see. This triggers a spear trap that come out of the ground in front, a few paces further, out of sight is a Falmer hive on the left-hand wall with a leveled Falmer lurking inside. The path turns to the west again and the tunnel changes to Dwemer architecture. At the end of a short tunnel is a long dangerous drop, with a series of ledges you need to use to avoid severe damage or death. The final drop is onto a platform at the top of a curving ramp, where another pressure plate triggers poison darts to fire from the wall behind you. The ramp curves around the shaft to another ledge and a second straight ramp leads down to a ledge with a stone pool containing shallow water, with another ramp curving down from this ledge. Below is a leveled Falmer and frostbite spider on a ledge with a Falmer hive concealing another Falmer on the wall. A final curved ramp leads down to the ground and a corridor heading west with a track for a spinning blade trap down the middle. The corridor descends a short ramp to a crossroad, with two Falmer, one of which is leveled, standing in a dead end to the left, just out of sight. Using Detect life or the Aura Whisper dragon shout may make it look like just a single Falmer is standing there. There is an unlocked Dwarven chest ahead at the crossroads, and a corridor heading to the north from the chest, this leads into another ice tunnel that turns to the west after a short distance. Ahead it opens into a room of Dwemer construction with a large staircase with a collapsed Dwarven Centurion--(see notes). Three more enemies guard the top of the stairs, consisting of a magic-using Falmer, frostbite spiders, skeevers and/or a leveled chaurus, depending on your level. The door at the top of the stairs leads to the second zone, Temple of Xrib. The Temple of Xrib is comprised of a mixture of Dwarven ruins and frozen caves. Upon entering, a wide corridor rises to the west, turning north at the top before quickly turning west again. Through a short corridor lies a room guarded by a leveled Chaurus, with a leveled Falmer patrolling a cylindrical tunnel in the room's southwestern corner. This tunnel, through which a Falmer tent is visible, leads into a large cavern. 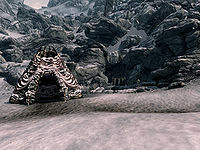 There is a hive on the wall to the left containing a Falmer, several more of which are further into the cavern behind a rock wall to the tent's right and will be alerted by noise from fighting the first. The first tent, reachable by climbing an earthen ramp, has only a campfire inside, and a second empty tent lies to the right, along with a Falmer hive on the wall. Behind the first tent is an open pen with a few piles of chaurus egg sacs and a ledge (see bugs). The path continues to the west, entering a tunnel that then turns to the south before opening out into a massive mist-filled cavern with wide stairs leading up to the south and a high ceiling that glitters like that of Blackreach, which itself is rivaled by the huge Dwarven structure before you. You can spend a lot of time exploring different ledges and corners in this cavern, but there is nothing of interest away from the main path. From the cavern's entrance, you can see the top of a Falmer tent at the top of the first flight of stairs. A magic-using Falmer and a chaurus stand to the right of the tent, which has a fire inside. Behind, there are more levels, with a distant pair of pillars several levels above the entrance. From the top of the stairs, you can see more stairs off to the west with two more Falmer patrolling the top. Climbing the second flight of stairs reveals a Falmer tent to the right with a fire and an unlocked chest. To the west, a path climbs a curving ramp. To the south, an unlocked chest sits in front of a second tent. At the other end of this level, a third Falmer tent contains yet another unlocked chest. Between the second and third tents is a flight of stairs crushed by falling masonry. The curving ramp on the path to the west leads to a lit corridor, where a magic-using Falmer and a chaurus are patrolling. 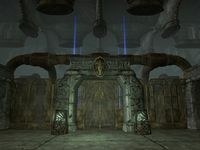 There is an unlocked Dwarven chest on the left of the second hanging light, and beyond this another curving ramp to a tower above, guarded by another leveled Falmer. There is a short ramp down on the other side to the level with the two pillars seen from below. There are many more enemies, including a boss leveled Falmer, chaurus, frostbite spiders or skeevers on this level, so a Detect Life spell or the Aura Whisper dragon shout is recommended. In the middle of this level, at the rear between two pillars lies a smaller pillar with a large unlocked boss chest in front. To the east is another lit tower with a lift to the third zone, the Abandoned Cave. The Abandoned Cave is an unoccupied zone that serves as the exit for this ruin and cave system. There is a short corridor to the south to a door that is barred from the inside, preventing you from accessing the Temple of Xrib without first traversing the Sightless Pit. The only items of interest in this cave are a couple of snowberry bushes and a few glowing mushrooms which can be harvested along the path. Exiting out to Skyrim will bring you to a ledge overlooking the entrance to Sightless Pit. A small path up from the ledge leads to a stone altar with a skeleton lying on it holding a leveled, possibly enchanted weapon. Two more skeletons that will reanimate, one on either side of the altar when you approach it. The skeleton on the altar can be exploited for unlimited gold. There is an unmarked altar at the mountain above the entrance of the pit, built out of Dwarven material, that has a copy of the The Doors of Oblivion. According to the Prima Game Guide, this location is called the "Altar of Xrib". There are numerous piles of bones scattered around, and picking up the book will cause the skeletons on the altar to come to life. It is unknown who or what the "Xrib" that the temple and altar refer to is, but it may be something the Falmer worship. You cannot interact with the Dwarven Centurion on the stairs at the end of the first zone. This is by design. There are multiple places within this dungeon that followers can get stuck. At the large pool right at the beginning, the follower could stay indefinitely underwater and cannot be commanded to move out. At some of the few dropping edges, the follower could keep attempting to jump down, but would stay at the same location. Sightless Pit appears in Legends as a quest and a card. Behind one of the tents in the Falmer camp near the beginning of the Temple of Xrib, you can walk up onto a small ledge that has a glitched wall texture, allowing you to step out of the playable area and see further into the zone. You cannot proceed any further, however, and can only step back onto the ledge. This page was last modified on 10 December 2018, at 02:23.